In a skillet, heat olive oil on medium heat. Place the peppers, onions, black beans, and corn in the skillet. Cook for 10 minutes. While skillet mixture is cooking, place lettuce and tomatoes in salad bowl and mix guacamole ingredients together in small bowl. Add the cooked chicken, cumin, and chili powder to the skillet mixture. Stir and cook mixture for 2-3 minutes until chicken is warm. Place skillet mixture on top of the lettuce and tomatoes. 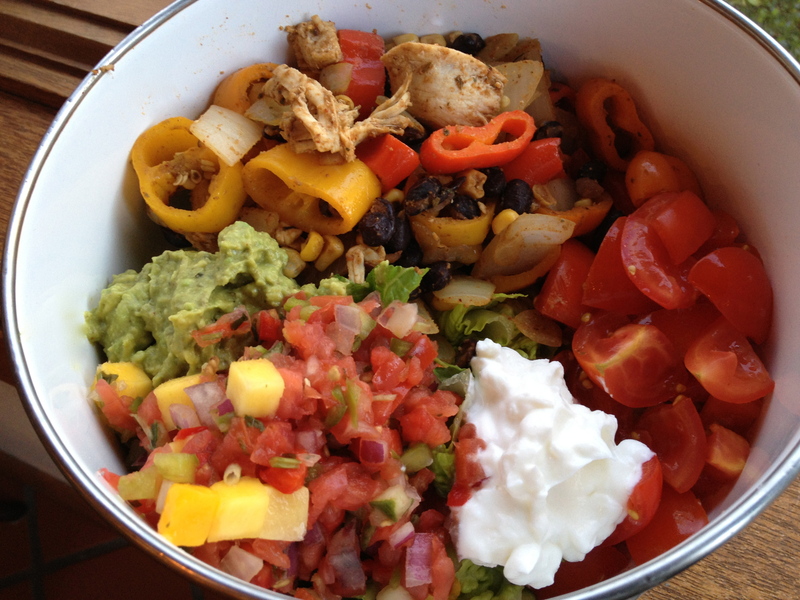 Add toppings (guacamole, salsa, and greek yogurt). For more Mexican Recipes visit my blog post “Esta Noche, Vamos A Comer Comida Mexicana Para La Cena” featured on Cinco de Mayo!